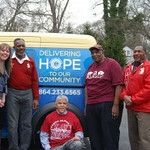 Senior Kappas of the Greenville Alumni Chapter are involved in Delivering Hope to senior citizens in the Greenville community. Each Tuesday of the week Meals on Wheels clients on route GVL2018 receives their mid-day meal from a member of the Senior Kappa Committee. We wanted to get involved is a project that did not require a lot of time, was of real benefit to senior citizens and was in keeping with the high ideals of Kappa Alpha Psi. Meals on Wheels is an ideal fit. Brothers Alan Kagler, Bobby Brockman, Edward Ruffin, Louie Golden, Hiram Springle and several spouses have been volunteer drivers and/or deliverers on the Kappa Alpha Psi route. Everyone who has participated expresses their self-satisfaction in serving individuals who are sick, shut in and have little personal contact with other people.